In this post you will learn how to setup and optimize SEO for local business using WordPress. The way the internet has changed our lives is remarkable. Most of our data, information and relationships have shifted online, while the answers to all our questions are just a Google search away. Naturally, this has also changed the way consumers look for different local businesses online. With an estimated 1 in 3 Google searches being for local businesses, brick and mortar companies can’t afford to ignore SEO for their e-commerce websites and storefronts. Fundamentally, local SEO is not very different from conventional SEO. The only difference is in the additional emphasis on contact information and on ensuring your website is optimized for more localized keywords. This gives a site more prominence in the local market. Thankfully with WordPress, building a strong local SEO foundation is not very difficult. Apart from the different SEO plugins, WordPress itself has a number of built-in features that can help you strengthen your local search engine presence. To make this topic more digestible and actionable for you, I’ve divided it into two separate posts. The first one focuses on using the built-in WordPress SEO features and the WordPress SEO plugin by Yoast. The second one will address some of the external factors that impact local SEO and how you can control them in WordPress. Let’s start with the internal WordPress settings first. To change your default URL structure to the optimized version, go to Settings > Permalinks in your WordPress dashboard. Optimized URLs are one of the fundamental components of an SEO strategy and help the search engines understand your website content better. Keyword research is an important part of any SEO strategy. But for local SEO you need to be more specific with your target keywords. For example, if you have a bakery in Boulder, Colorado, then longtail keywords like “bakeries in boulder Colorado,” or “fresh cakes boulder Colorado” will be more suitable for your website. Use the Google keyword planner to get an idea about the right keywords that your target users are searching for. You can also use the 5minutesite keyword tool. 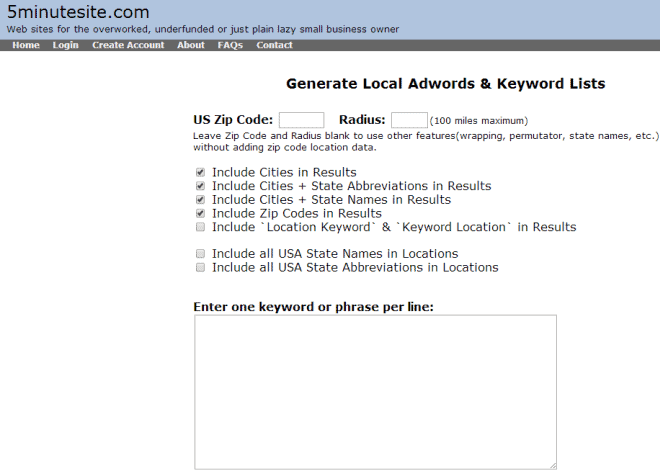 This is a free tool that gives you a list of keywords depending upon your location and industry. Every local search query includes city, state, and even town level keywords. So using the different variations of your location name will come in handy. However, don’t be too obsessed with this part. Google is now smart enough to relate different keywords with their synonyms. You only need to make sure your main target keywords reflect your location name clearly. Tip: For a more in-depth tutorial on using Google Keyword Planner, head over and read this post. Or, you can check out a fantastic tool for researching keywords and your competition. The best way to optimize your WordPress website for search engines is to use the WordPress SEO plugin by Yoast. This is by far the most effective SEO plugin that comprehensively covers all aspects of SEO. You only need to worry about two fields here Titles & Metas and XML Sitemaps. Start setting up the title for your main index page first, because that’s your most important landing page, and then move onto the other pages. Similarly, focus on making your meta descriptions catchy and action-oriented. In case you didn’t know, a meta description is a short description of your page that appears in a Google search result. The meta-description is not indexed by Google and does not directly impact the search results. But it has a direct impact on click through rates. So it’s important to include all the relevant and eye catching information about your page in the meta-description. Once you activate this, submit your sitemap URL (http://www.yourdomain.com/sitemap.xml) to your Google Webmaster Tools account. Tip: If you want to learn more about informing Google that your website exists, read this detailed post on the subject. Creating regular blog content tailored toward the interests of your target market is crucial for attracting local search engine traffic. Most of the time, users do not search with business names. Instead, most local searches are based on certain region specific questions. When you create blog content that covers problems or issues of a particular industry in a particular region, it automatically gives you more visibility in search results and a higher chance of getting referral traffic. Again, WordPress SEO by Yoast will come in handy for optimizing your blog posts. Use the relevant localized keywords in the title and content of your blog posts. Tip: If you would like a more detailed video walkthrough of how to use Yoast SEO Plugin on WordPress, I have a tutorial here on Youtube. Taking the same example of the burger joint in Boulder, the following titles will give you more visibility in local searches. Your business website, no matter how efficiently you optimize it, will contain a limited number of pages. But when you add a blog as well, you can create unlimited posts targeting specific local search keywords and the issues of your local target audience. As you can imagine, this will give you a lot more exposure in local searches. You should also display the latest posts from your blog on the homepage of your website. This improves the cross linking in your website and also gives exposure to your content. In terms of design, there are different positions for displaying your latest posts on the homepage. For inspiration, here are a few examples. Having the right URL structure, using localized keywords and creating high quality content are some of the most critical local SEO requirements. If you consistently create new blog content that is tailored according to the needs of your local target audience, you’ll see a gradual rise in your search engine traffic from local keyword searches. So get on out there and starting creating, you will surprised at the results. FREE Bonus: Download your Free SEO Checklist which will show you how to quickly improve your SEO on all pages and post. Included are extra tips and resources to help you even more. Brenda Barron is a freelance writer from Southern California. She specializes in WordPress, technology, and business. When not writing all the things, she's spending time with her husband and daughter, who's really into pirates right now.